The home of classic foods like the Zinger Burger and Popcorn chicken, KFC is one of the fast food greats. Its hot chips might be second-best when compared to McDonald’s salty french fries, but our love for KFC is just as great. Healthy eaters don’t you hate on us; we know the smell of greasy KFC chicken gives you the sweats too. 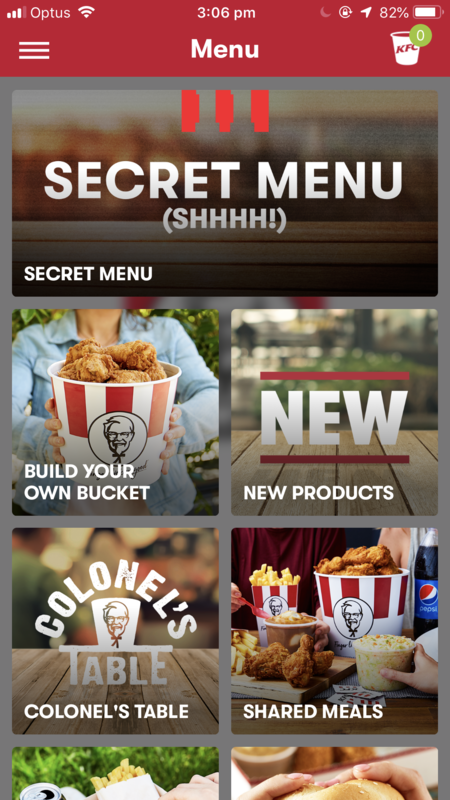 But we have the ultimate KFC plot twist: there’s a ‘secret menu’ of unreleased items. And not just any unreleased items - it’s burgers. The secret burgs are called the Beese Churger, Zinger Chipster and Slida Burger - all valued at $6.95 each. A regular burger with a Zinger fillet, cheese and mayo and burger buns which have been flipped upside down. A Beese Churger - we geddit! “Honestly, we're not sure how, but it really works, trust us,” KFC said. A “next level” Twister with a Zinger fillet, fresh lettuce, cheese and sauce all wrapped in a tortilla. Sounds pretty standard. Except it also has crispy hot chips inside. KFC's take on a 'low carb' burger. Don’t roll your eyes it still has all the best trimmings: a Zinger fillet, smoky bacon, fresh lettuce, cheese and sauce all packed between two flatbread buns. The best part is the menu gets updated regularly so there’ll always be something new and exciting for you to order. So how the hell do you get your mitts on one of these masterpieces? You download the KC app, select your nearest store, tap 'order' and drag your fingers from the top to bottom of the screen continuously. A cartoon Colonel Sanders will appear at the top, peaking out from behind a KFC bucket. Keep dragging until he grows bigger and eventually a ‘secret menu’ button will appear. It might take a few goes (the Colonel is a little stubborn and won’t reveal his secret menu to just anyone, it seems), but it’s well worth the effort. RIP all of our diets. Images: KFC Australia / Instagram, Giphy / Giphy.